I write these words on a device that once only existed in the realm of science fiction and the minds of those who penned it. As I write them, another device that once only existed in some far off, future place signals to remind me of something I need to do. I pick this device up, speak to it and a pleasant voice answers me back and confirms that she has changed the reminder to another time. I walk over to a dispenser, press a button and 30 seconds later I have a hot cup of coffee to help me focus on the words I want to write. All of these things I take for granted, ubiquitous and common that they are. I remember so well when they weren’t. Star Trek and I were born the same year and Leonard Nimoy was at least half the face of Star Trek, along with William Shatner. By the time I was old enough to understand what it was, the show was already over and cancelled, yet syndication and reruns ensured that it would be there for me to enjoy, to absorb and to ponder the unimaginable possibilities of the distant future. Computer terminals that placed the sum of humanity’s knowledge at your fingertips. Portable pad computers that you carried in your hand and communicators that allowed you to talk to others at great distances with no wires attached. Computers that did what you told them to do and who could answer you back…and food dispensers that dispensed food in moments, no heating required. All this and more were the world of Star Trek and it was a world I wanted to see. An uncle who worked for NASA in Huntsville fired my imagination for the moon mission and space exploration in general but when he died, it was Star Trek and those unforgettable men and women, traveling through the galaxy on their beautiful, fantastic space ship that stoked those fires in the years afterwards. He and that show were probably the genesis of my fascination with technology and I grew up secure in the knowledge that we had been to the moon and that space exploration would follow behind. Little did I know that so much of what Star Trek painted as the future would come to pass just a few decades later and continues to this day. When my high school got its first desktop computers, they were closely guarded and kept under lock and key. I couldn’t wait to get my hands on them, primitive as they were and to learn all I could about them. Today they are relatively cheap, easily accessible and practically indispensable. My first Nokia cell phone gave way to a Nextel flip phone that looked like it had come right out of Star Trek. Flip it open and push to talk to anyone else you knew that had one. BlackBerries were next and finally the iPhone with its touch screen and Siri voice activated assistant. Having a conversation with Siri wasn’t always easy because unlike the Enterprise computer, Siri had a hard time understanding a Southern accent but to her credit, she got better quickly. The iPad liberated me from the desktop, a revolution in space age design and materials, a portable window to the internet and the world beyond. Microwave ovens that could cook in minutes seemed so much like the food dispensers on the great starship and now Keurig can make a cup of coffee almost as fast as the Enterprise could. Like many of us, these things of future wonder and fantasy became a part of my life but so gradually that I never stopped to think for a moment how truly awesome these things I once coveted were now that they were here and in everyday use. When I heard that Leonard Nimoy had passed away today at the age of 83, I couldn’t help but think how much his character had shaped the lives of so many over the past five decades. Coldly logically, brilliantly articulate and surprisingly human at times, The character of Commander Spock was one of the most complex individuals created for the small screen. He, more than anyone else, was the face of that future, alien and unknown, yet full of promise and hope. It’s even harder to think of a television character that so fully embodied and defined a personality type. 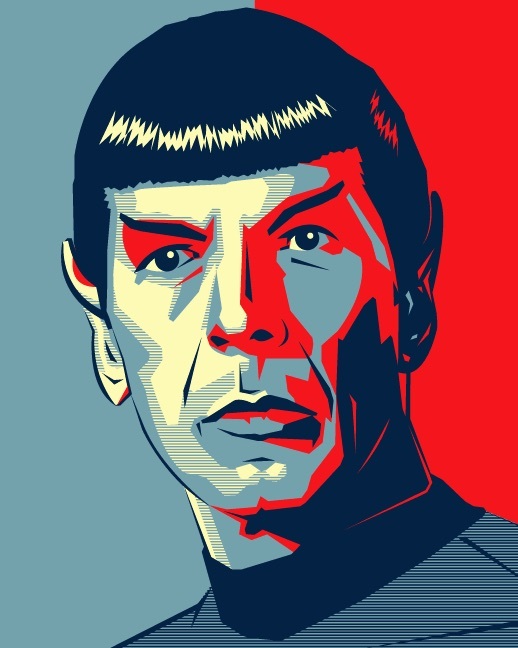 Just as Captain Kirk became synonymous with action and Dr. McCoy with passion, Spock was dispassion personified. Even those who never watched Star Trek knew who Mr. Spock was because his name had become mainstream in our society. Much will be said about him in the days ahead but I just want to simply say that he lived long and he prospered and because of the show he helped make so enduring, a generation of us envisioned all that was possible, all that could be and in many ways, what is now, today. To quote another line from the show, he boldly took us where no one had gone before. We are better for that. Thank you, Mr. Spock. Thank you, Leonard Nimoy. Nicely done. My parents and my mom’s dad were all Trekkers so it was fait accompli that I would be too. I came along just before the show’s second season started and so caught it all in syndication, too. Our PBS station aired them restored and uncut in the 80s — heaven. Thanks Jim…I too was a child of that era and the appeal of Star Trek and Spock and all that it implied for the future of space travel never went away for me.